Yarn Type A gorgeously soft yarn with an incredible Fair Isle colour effect that appears as you knit. Inspired by the gentlest colours of the Scotland Highlands, Snuggly Baby Crofter Dk is the same wonderfully soft blend of 55% nylon and 45% acrylic as Snuggly Dk, and is machine washable and easy care. This yarn will also knit to all Sirdar double knitting baby patterns. 16 adorable designs for boys & girls from birth to 7 years, in 4 new vibrant self patterning shades. Perfect winter warmer accessories, jumpers and cardigans ready for exploring the outdoors. 12 adorable designs for babies, boys & girls from birth to 7 years knitted in Baby Crofter DK. 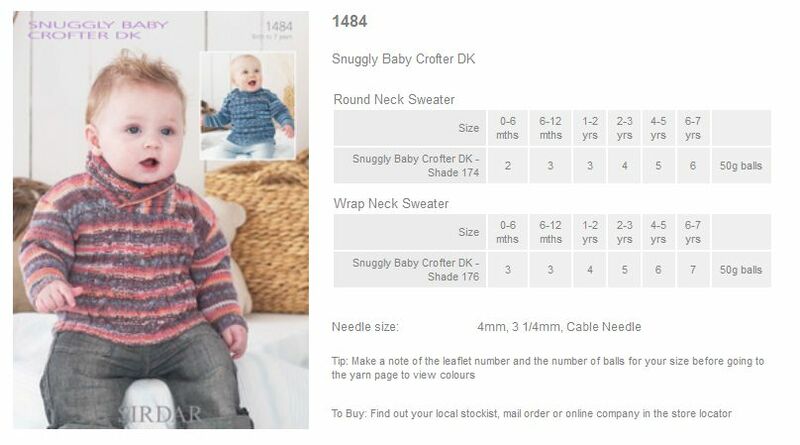 In this Baby Crofter DK collection the Sirdar design team has created designs for little boys including trendy cardies and sweaters, and combined stitches to create cool patterns. Then for the little girls there are gorgeous little cardies with frills, a pretty crochet hoodie and the cutest dress with Snuggly DK collar and matching headband! 14 adorable hand knit designs for babies, boys and girls from birth to 7 years. For the wee girlies designs include gorgeous pinafore dresses, cardies with pretty lace edges and adorable bootees and a bonnet to keep the tiniest tootsies and ears nice and warm. Then for the little lads there are trendy sweaters that show off the Fair Isle effect of Baby Crofter wonderfully and gorgeous cardies that come in collared and v-neck versions. We also have designs for the snuggliest blankets and the cosiest sleep sacks, theres one for the boys and one for the girls. 15 adorable designs knitted in Sirdar Baby Crofter DK for baby boys and girls from birth to 7 years using a selection of beautifully soft, powdery Baby Crofter shades. For the little lads there are fisherman's rib sweaters and cardies that show off the Fair Isle effect of Snuggly Baby Crofter wonderfully. Then for the wee girlies we have cardies and hats finished off with the prettiest flower embellishments, trendy ponchos and adorable cat character accessories; bootees for tiny girls and a bag for when she is a little bit older that is sure to make her the envy of all her friends. And four beautiful Baby Crofter blankets, two of which are finished off with Snuggly Snowflake edges for the cosiest slumbers around. For this latest collection of 17 designs for babies and children we have chosen a selection of colours that includes soft pastel mixes, such as purples, pinks and blues, as well as some stronger ones with oranges, yellows and greens. This collection is full of adorable designs, for the little lasses there are pretty lacy cardies, cardies finished off with teeny tiny bows and those edged with a matching Snuggly DK trim. For the wee lads there are textured little sweaters and cardies and of course he can have his edged in his favourite Snuggly DK colour too. We also have designs for four of the snuggliest Baby Crofter blankets, as well as the most adorable dinosaur and bunny toys! 12 hand knits designs for boys and girls from birth to 7 year knitted in Sirdar Baby Crofter. There are traditional little styles for girls with exquisite details - cardies and blankets with mock reverse stocking stitch detailing and cardies with the prettiest bobble yokes. Then for the chaps there are adorable toggle jackets, the cosiest onesie and stylish little hoodies. Last but not least, we have the friendliest Crofter doggy toy imaginable - he can be made into a scarf too! 16 hand knit designs for babies, girls and boys from birth to 7 years using Sirdar Snuggly Baby Crofter Dk. This book has the sweetest and most adorable designs for girls. There are pretty boleros, little cardies with fan and feather edging, a traditional little lacy bonnet, and four of the most adorable shoes designs. There is also a pretty lace blanket. 15 hand knit designs for babies, girls and boys from birth to 7 years knitted in Sirdar Snuggly Baby Crofter DK. This book has a brilliant mix of traditional little knits for the bonnie wee girls, there are cute jackets with little bobbles, pretty scallop edged cardies and a lace knit cardigan with a beautiful matching bonnet. Not forgetting the little lads of course; we have simple little cardies, cute vee-necks with a pom-pom hat. There is even a Baby Crofter blanket as well. 18 hand knit designs for children from birth to 7 years in Sirdar Baby Crofter DK. Leaflet with designs for Blankets using Sirdar Snuggly Baby Crofter DK. 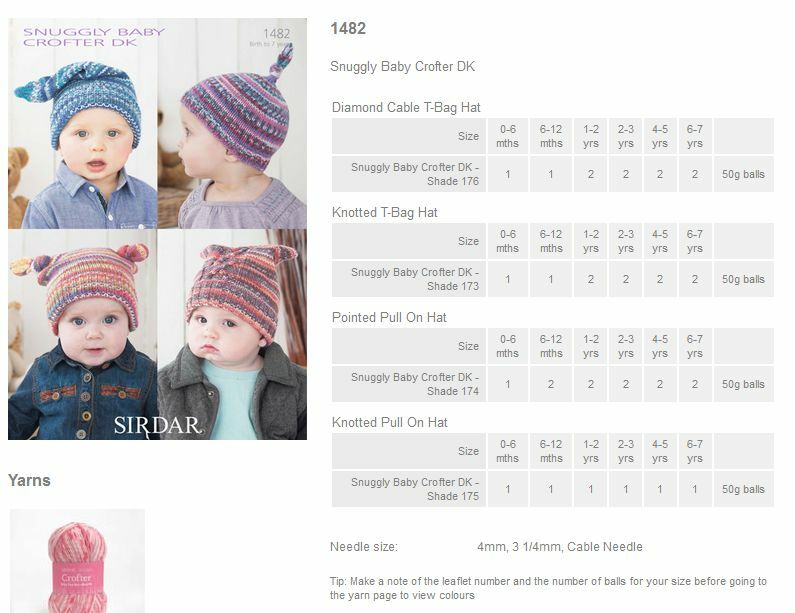 Leaflet with designs for Hats using Sirdar Snuggly Baby Crofter DK. 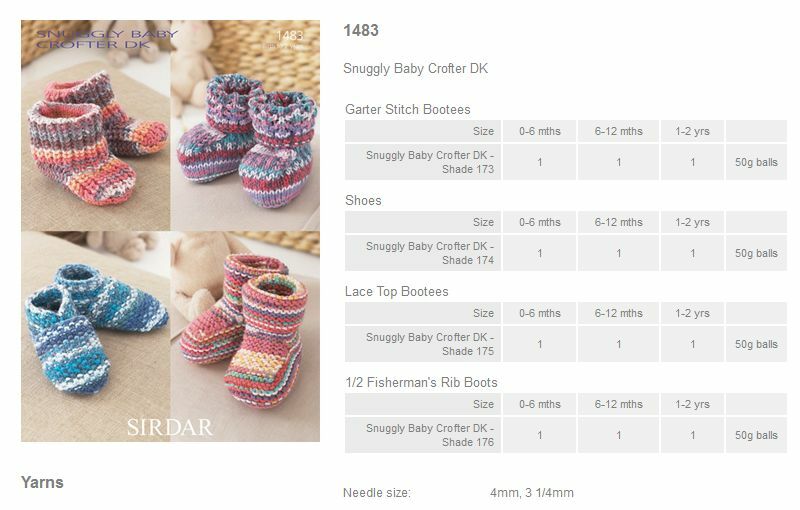 Leaflet with designs for Bootees, Shoes and Boots using Sirdar Snuggly Baby Crofter DK. Leaflet with designs for a Round Neck Sweater and Wrap Neck Sweater using Sirdar Snuggly Baby Crofter DK. Leaflet with designs for a Round Neck Cardigan and Shawl Collared Cardigan using Sirdar Snuggly Baby Crofter DK. 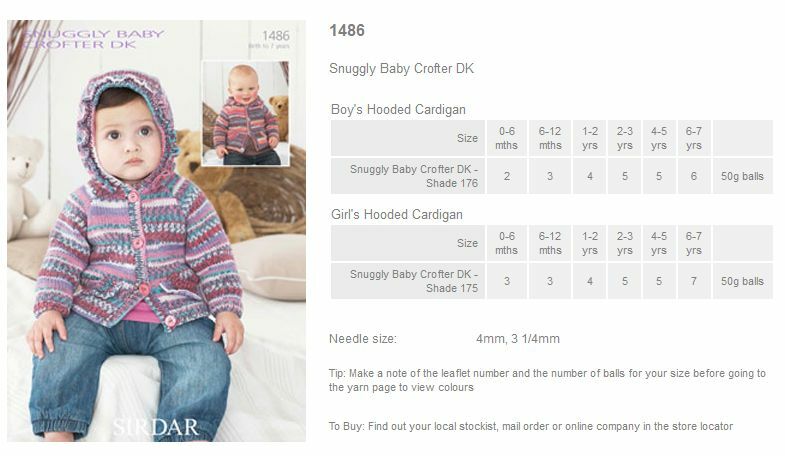 Leaflet with designs for Boy's and Girl's Hooded Cardigans using Sirdar Snuggly Baby Crofter DK. 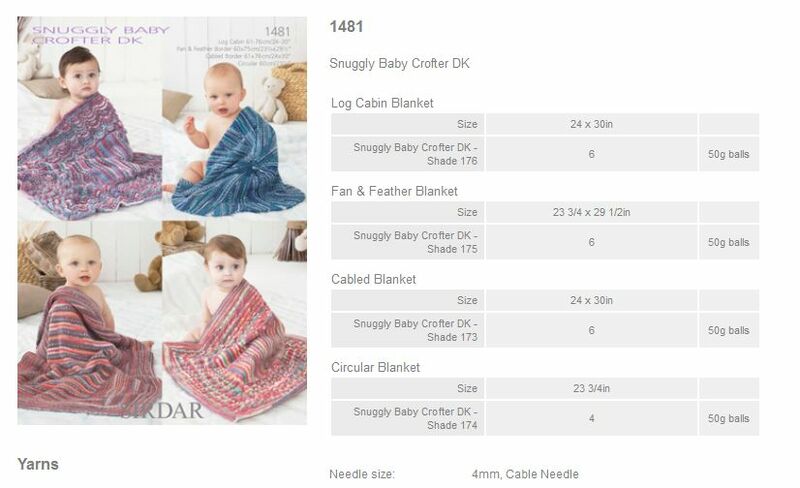 14 designs for babies and children from birth to 7 years using Sirdar Baby Crofter DK. In this book weve added tiny cables, lace stitches and eyelets to create hand knits with patterns and textures together. There are easy first knits for boys with cosy shawl collared ribby cardies and eyelet and lacy borders on cardies for little girls. Also an adorable lattice lace blanket - a stunning addition to any nursery. Fair Isle knits without the fuss - Snuggly Baby Crofter DK with an incredible Fair Isle effect that appears as you knit! 18 handknit and crochet designs for girls birth to 7 years using Snuggly Baby Crofter DK. The fifth Baby Crofter book has cosy, cabled cardies and the cutest crochet capes and helmets youve ever seen. There are adorable knitted coats and little curve-edged cardies with bonnets and mitts to match , adorned with the prettiest knitted bows. 13 hand knits for babies and children from birth to 7 years using Sirdar Snuggly Baby Crofter Dk. We have created 13 little hand knits for this book, with easy to knit designs for babies and children from birth to 7 years - there are the prettiest little capes and lacy cardies for girls and trendy hoodies and classic raglan sweaters for boys. We have also designed 3 colourful blankets with diagonal, chevron and patchwork patterns to keep all your tiny little crofters cosy. Snuggly Baby Crofter Dk - for beautifully soft baby Fair Isle knits without the fuss! 14 handknits for babies and children from birth to 7 years in easy, fairisle effect Snuggle Baby Crofter Dk. This Cosy Little Crofters book is crammed with adorable handknits for your little ones - there are the prettiest, lacy smocks and easy cardies for little lassies and the cosiest little shawl-collared cardies and trendy jackets for your little lairds. 12 hand knit designs for babies and children up to 7 years in easy, fair isle effect Baby Crofter Dk. Our second 'Baby Crofter' book is crammed with trendy design for boys and girls. We've designed hoodies and cardies for boys and girls with gorgeous cables and textures and there are trendy helmets and bonnie berets with fluffiest pom-poms for cosy baby style.